Outdoor Gelatinous Cube. Card Artwork. Monster Class: An oversized, indoor, jello cube exposed to the outdoors makes an easy victory for any party. The Outdoor Gelatinous Cube is an anomaly. 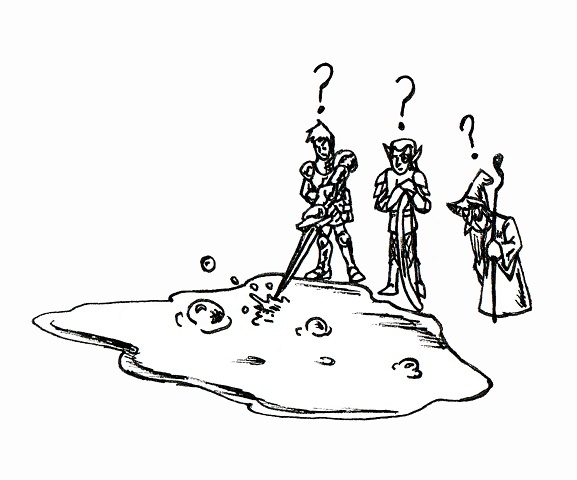 A creature that is, in essence, an acidic blob of jello that adventurers fight, yet is flawed in that it must remain in a cool environment. The Outdoor Gelatinous Cube forgoes its own inherent nature and dares to attack adventurers from the outside, with dismal results. This character was my playing on the enemy staple from dungeon crawlers. The Gelatin Cube that all adventurers faced, like dungeon rats, is a popular early enemy of the genre. So, I proposed the question of why does this monster only reside in dungeons and what would happen should it venture out of its normal environment. Hence the puddle of muck that this raiding party encounters.